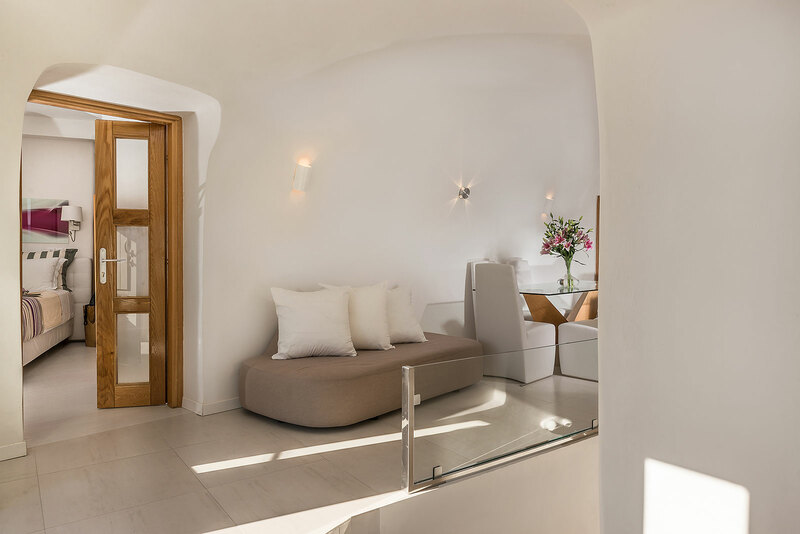 Elite Luxury Suites are a collection of 4 beautifully furnished suites all offering amazing sea views and private plunge pools. 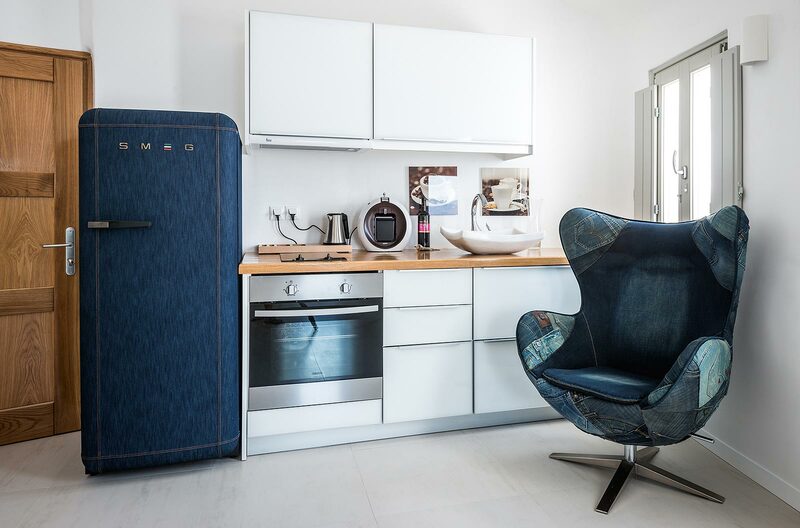 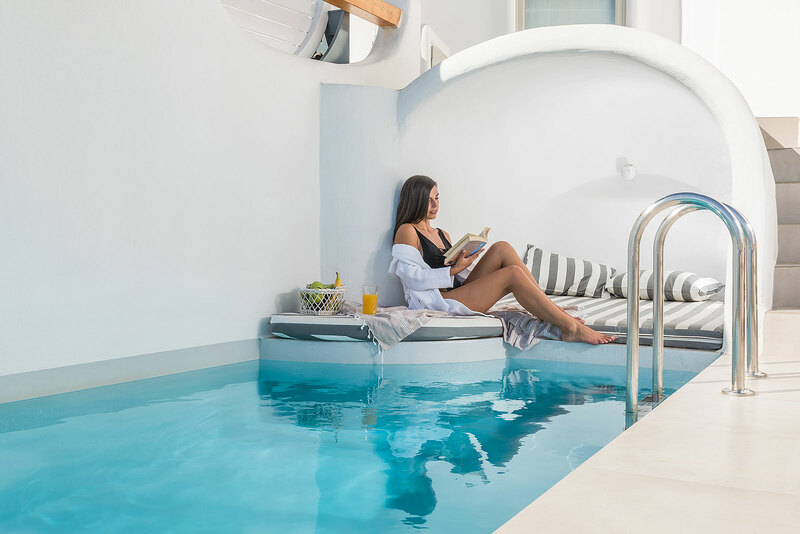 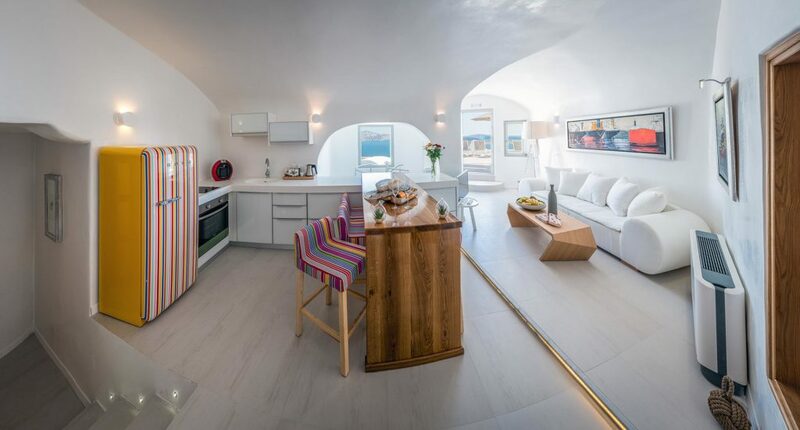 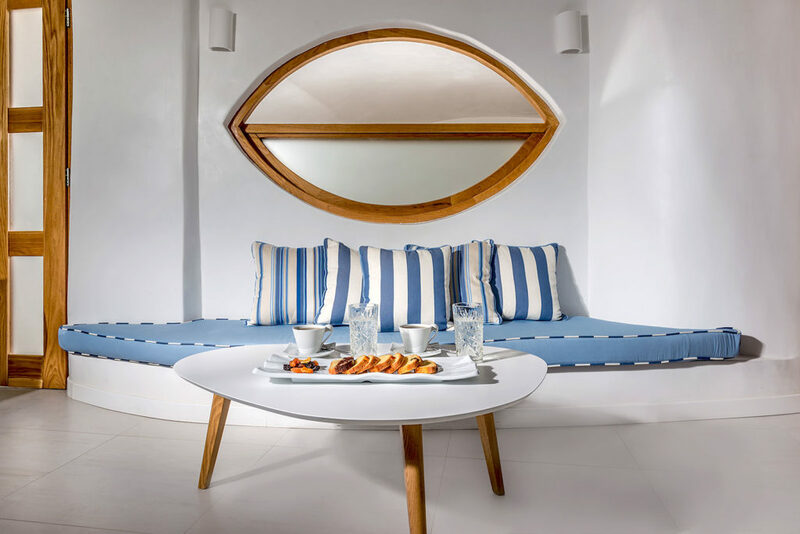 Each of the suites has been furnished to a very high standard with living rooms, well-fitted kitchens, spacious bedrooms and private pools all with unobstructed sea views. 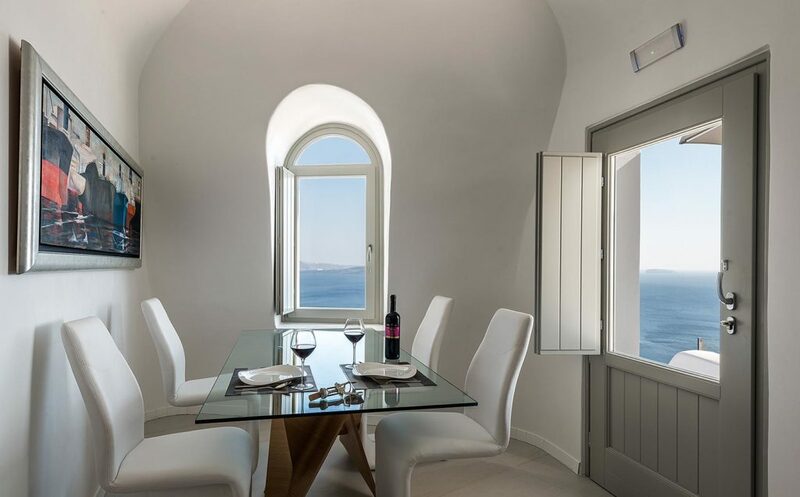 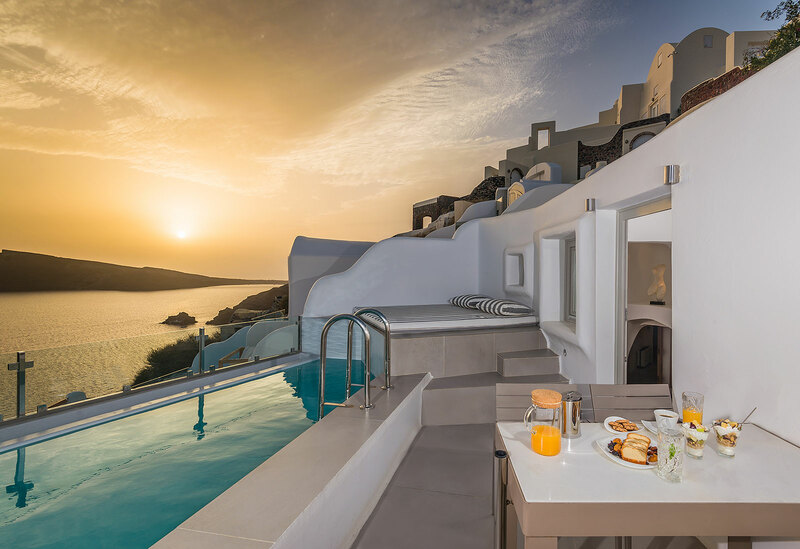 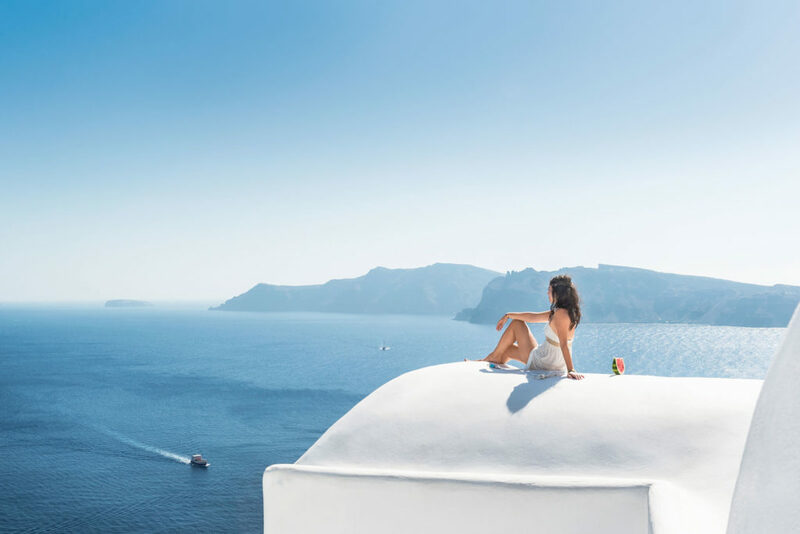 Elite Luxury Suites location: The suites have been carved into the caldera in the village of Oia and offer the perfect location for your visit to the beautiful and unique island of Santorini. 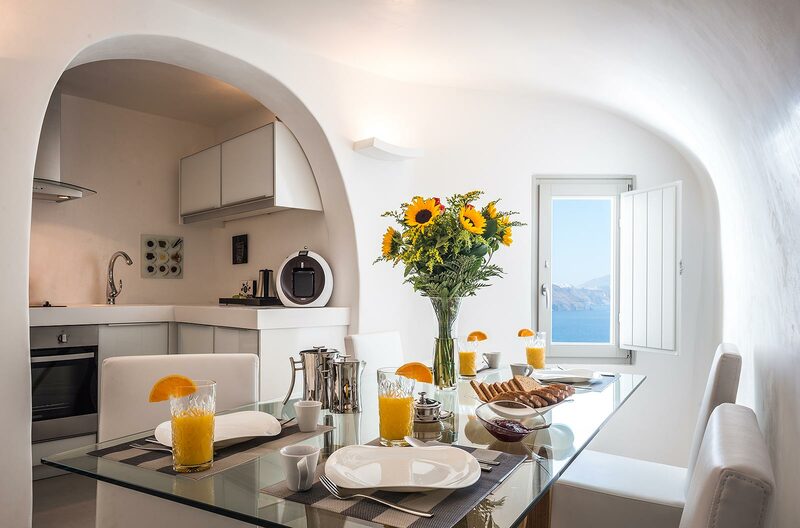 All the facilities of the village are close by with a good selection of cafes, tavernas, restaurants and tourist shops just moments away. 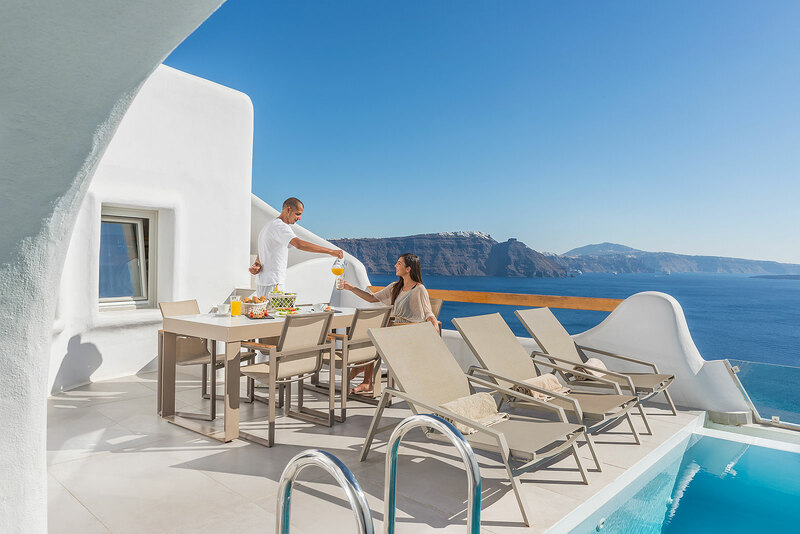 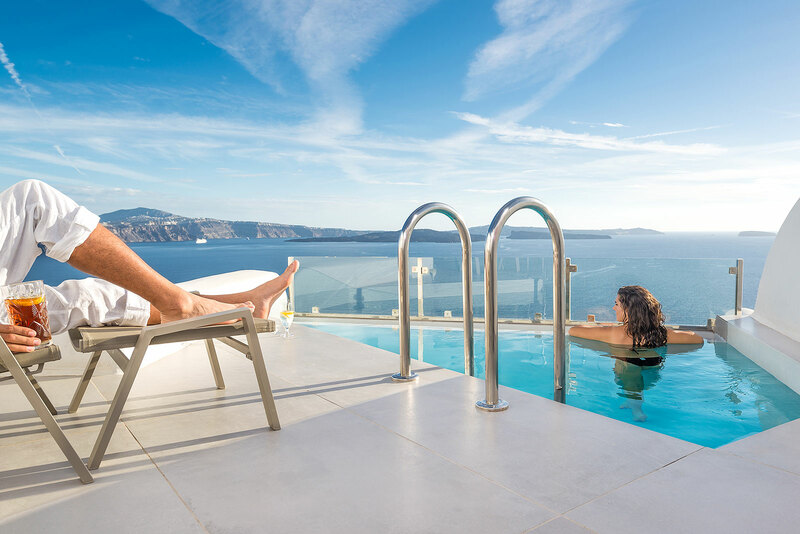 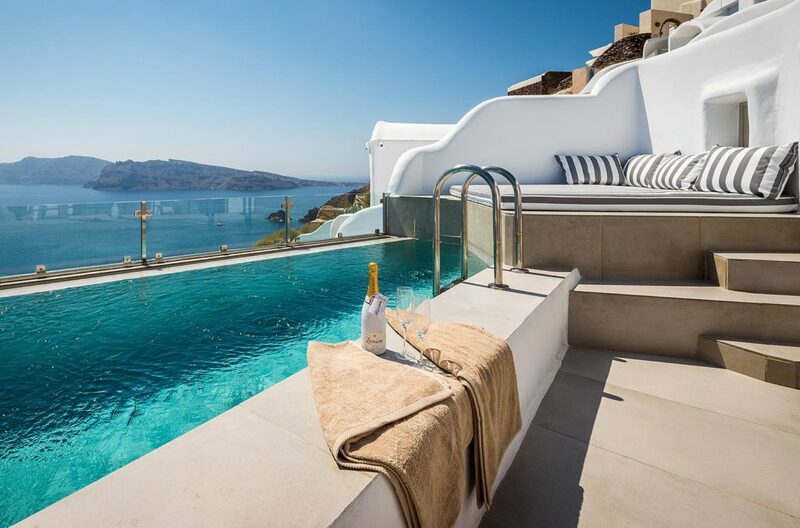 Presidential Elite – Beautiful 2 bedroomed suite offering 140 sq meters of living space and open views of the Caldera and shimmering Aegean sea. 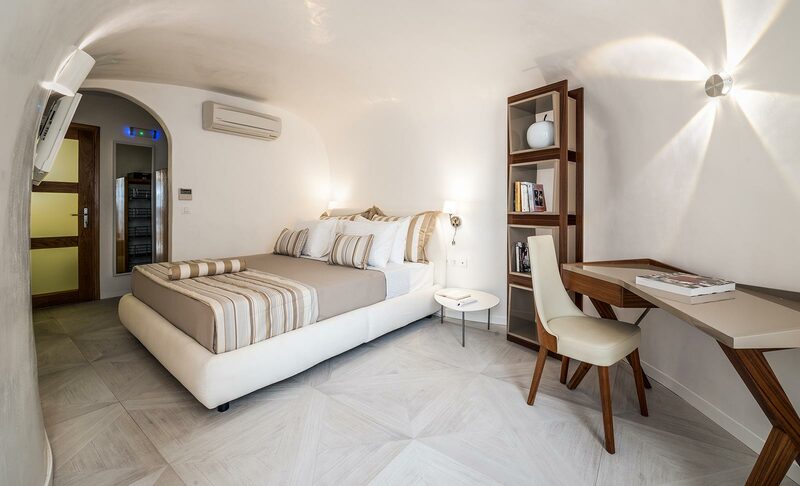 Features include a spacious terrace with private pool, living area with a fully equipped kitchen and 2 double bedrooms plus 2 bathrooms. 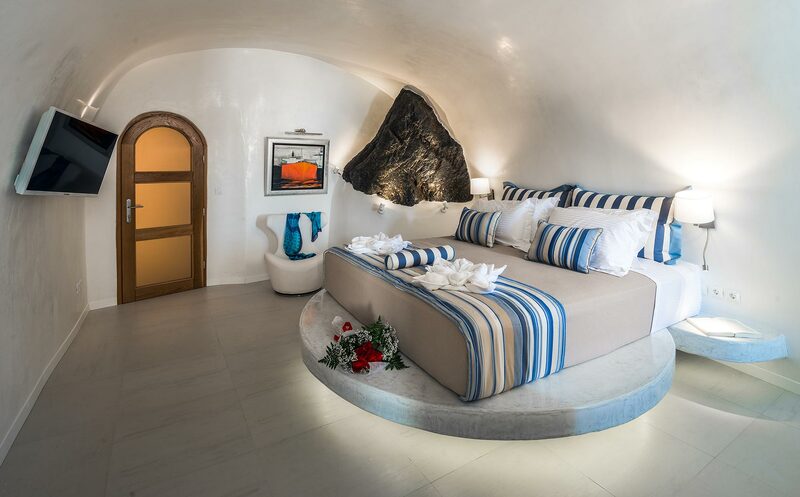 Grand Suite – Built in Cave style and offering 130 sq meters of living space, the Grand suite can sleep up to 6 guests in complete comfort. 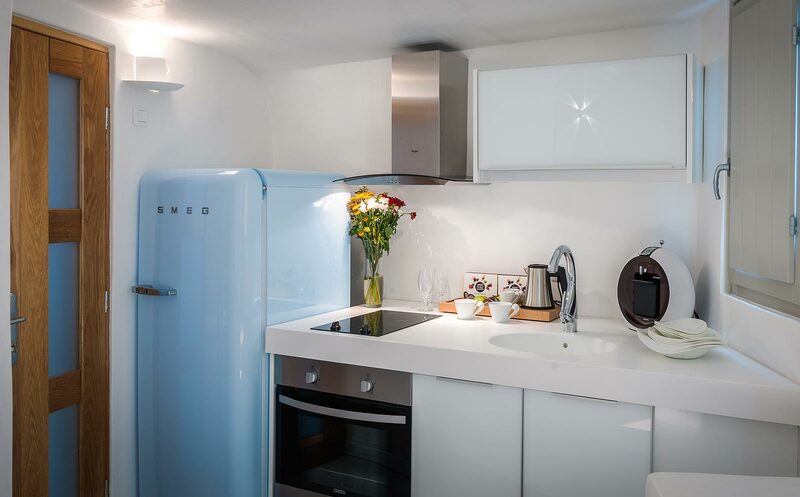 Features include living area with fully equipped kitchen, 3 double bedrooms all with en-suite and walk-in wardrobes. 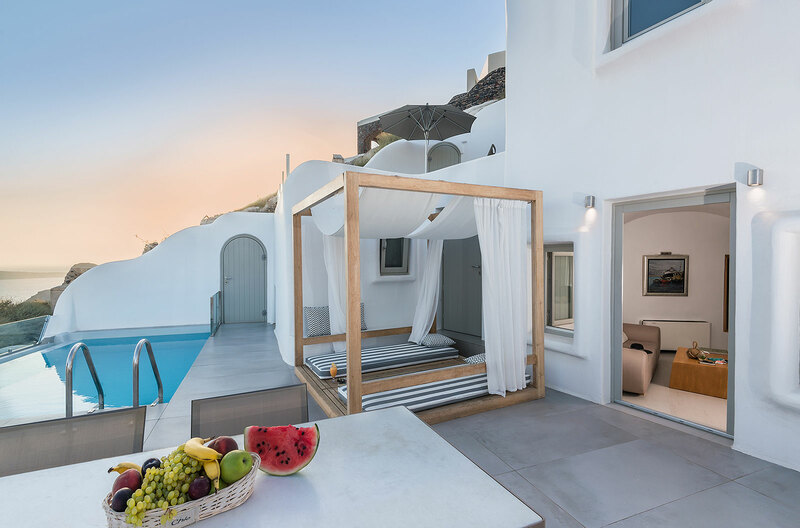 Private terrace with pool, sun loungers, and dining table. 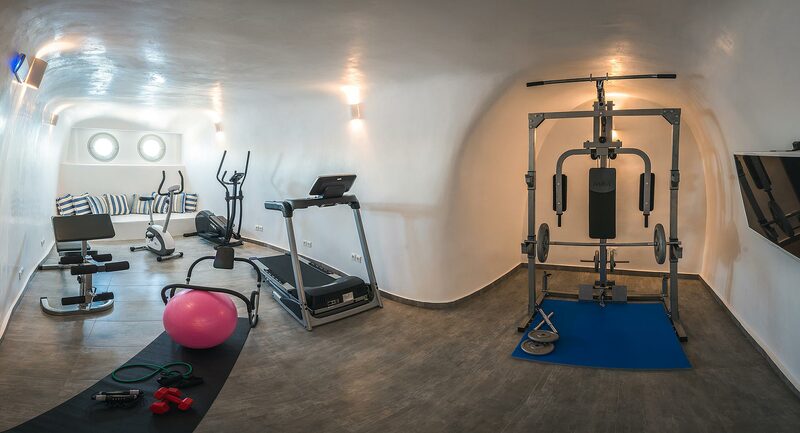 A small gym with fitness equipment is an extra feature. Premier Suite – This well-furnished suite offers 100 sq meters of living area and can sleep up to 4 guests in 2 double bedrooms both with ensuite bathrooms and walk-in wardrobes. The attractive living area with modern kitchen appliances, a spacious terrace with private pool, a chill lounge bed, and outdoor dining area. 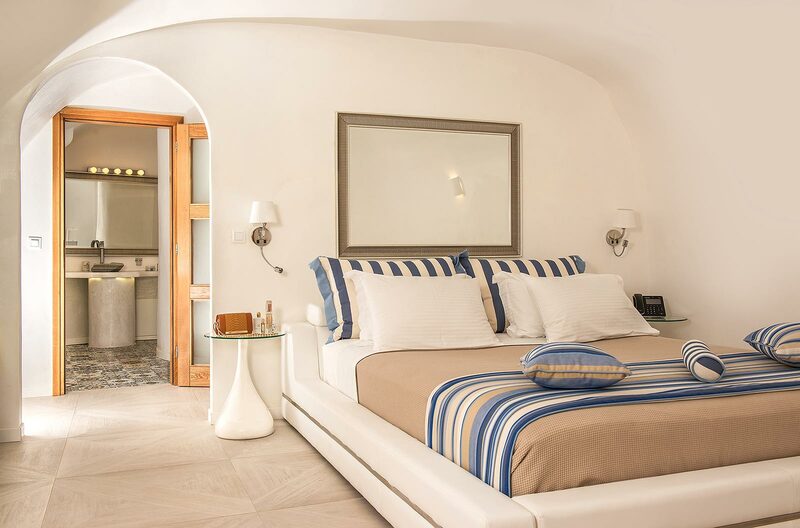 Elite Suite – The perfect suite for romantic couples, this cozy accommodation comes with a double bedroom with 2 bathrooms, a dining area with a well-equipped kitchen. Attractive terrace with plunge pool and wonderful caldera views.